Monitoring fuel pressure through laptop software. Thread: Monitoring fuel pressure through laptop software. Hi. I'm wondering if there’s any way to monitor the fuel pressure directly through the laptop. I currently have the laptop mounted in the car and operational at all times. Are the parameters there to do so with a specific output in the Sniper loom. One of those things that’d be nice to see when driving. Thanks Chris. The only way to monitor fuel pressure is by hooking up a transducer and connecting it to a Digital Dash of some sort. The Sniper does not have this ability at this time. You can monitor Base Fuel lb/hr, and Fuel Flow. Do you have a Sniper or a Super Sniper? I have a Super Sniper and a Digital Dash, and I can see fuel pressure and oil pressure on the dash. The Holley engineers hadn't figured out how to get fuel pressure and oil pressure to the handheld last time I checked, but the Super Sniper will datalog them and the Digital Dash will display them. If you have a regular Sniper, then I don't think there's anything you can do. i was trying to figure this out also before I hooked up my system . i found lots of pics online of sniper and the handheld ecu with fuel pressure showing in the left lower corner but I could not find a 100% answer . so I got an auto meter gauge & adapter and hooked up the electric sender and the gauge is on the dash . here is a pic i found showing fuel psi and i have found a few others . 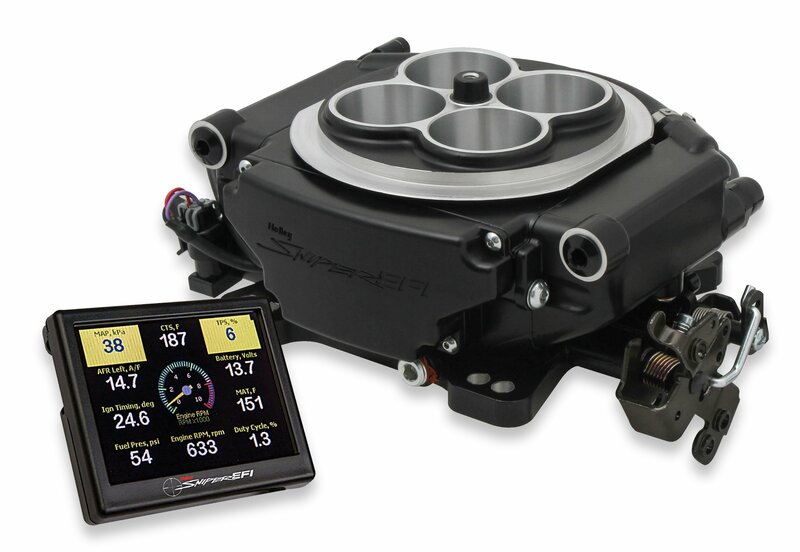 just rechecked their website and holley even shows the $995.99 sniper unit with fuel pressure on the handheld . Last edited by sweetk30; 11-09-2018 at 04:25 PM. I have a regular Sniper unfortunately, purchased just before the Super Sniper was released. All good, just noticed I’ve had another fuel pressure gauge fail, so was curious to know if it was possible. Cheers. Sweetk30 exactly what I’ll be doing now, just a basic electric gauge or mechanical with isolator inside (before) the cabin. I was trying to figure this out also before I hooked up my system. I found lots of pics online of Sniper and handheld ECU with fuel pressure showing left lower corner, but I could not find a 100% answer. So I got an Auto Meter gauge & adapter and hooked up the electric sender and the gauge is on the dash. Here's a pic I found showing fuel psi, I have found a few others. Just rechecked their website and Holley even shows the $995.99 Sniper unit with fuel pressure on the handheld. There is no way those pictures are showing the touchscreen displaying the actual fuel pressure from a "sender". The handheld can only display the setting, at least on the base Sniper. If the regulator gets plugged and the fuel pressure gets high, the display will still show only the setting. And just why does that photo show Sniper running at 54 psi? It should say 60 psi. Oh snap. Well that's deceptive, LOL. Just add it to the list of issues. I installed two analog fuel gauges on the hoses near the Sniper, since Danny told me the regular Sniper does not measure fuel pressure.